LISBON, Dec. 5 (Xinhua) -- Chinese President Xi Jinping met with President of the Portuguese Parliament Eduardo Ferro Rodrigues here on Wednesday, and they pledged to promote bilateral legislative cooperation. Referring to Portugal as a good friend and good partner of China in the European Union, Xi said China and Portugal properly resolved the question of Macao in 1999, setting an example for other nations in tackling issues left over from history through friendly negotiations, and laying the foundation of mutual trust and cooperation for the bilateral relations in the 21st century. In recent years, the National People's Congress of China and the Portuguese parliament have had close exchanges, producing good results, he said. China supports the two countries' legislative bodies to learn from each other on important subjects such as legislation, governance and issues related to national interests and people's livelihood, he said. Xi called on the two legislative bodies to explore the potentials for more cooperation, continuously improve the legal and policy environment, and protect the legitimate rights and interests of each other's investing enterprises and people. The two sides should strengthen communication and coordination within multilateral organizations such as the Inter-Parliamentary Union, safeguard common interests, and contribute to the safeguarding of world peace, development and prosperity, he said. Xi noted that China has taken an unprecedented development path chosen by its 1.4 billion people and constantly updated in line with the times. As this year marks the 40th anniversary of China's reform and opening-up, the country will continue to comprehensively deepen its reform and unleash development vitality, implement a higher-level opening-up policy, and promote the formation of a new pattern of all-around opening-up, said Xi. The Chinese president said such moves will lead to a new phase of China's opening-up to the outside world, and therefore bring new opportunities for bilateral cooperation. 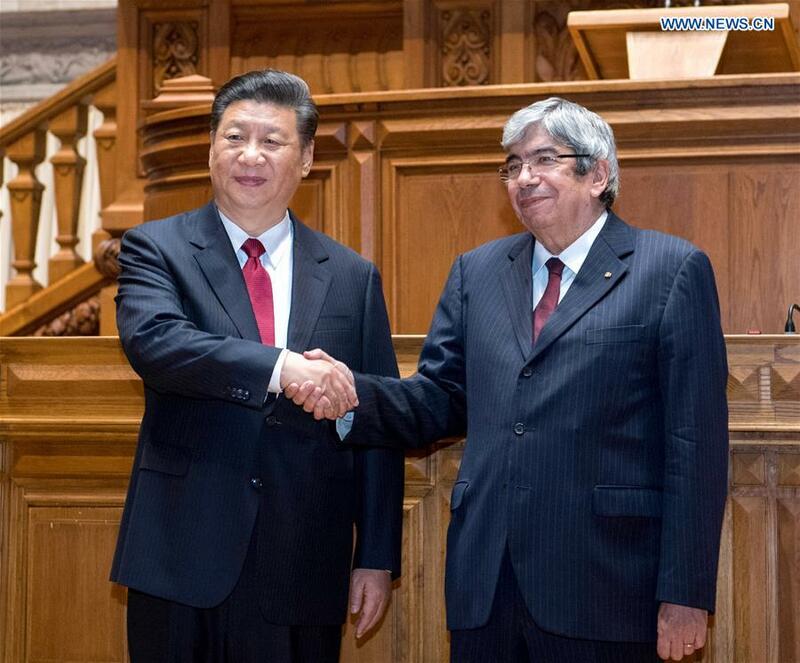 Rodrigues said that the Portuguese parliament warmly welcomes President Xi's visit, which reflects the advanced level of Portugal-China relations. Rodrigues said that China is a key trading partner of Portugal and that both sides advocate multilateralism. Portugal appreciates China's development achievements and hopes to transform the friendly mutual trust into more cooperation. He expects the two countries to expand bilateral exchanges and cooperation in the fields of economy, trade and culture, adding that the Portuguese side supports the Belt and Road Initiative, and is well positioned to become a hub of the Belt and Road in Europe. The Portuguese parliament is committed to deepening the Portugal-China relations, and will actively participate in the celebration of the 40th anniversary of the establishment of diplomatic ties between the two countries next year, so as to consolidate bilateral friendship, Rodrigues said. The Portuguese parliament hopes to continuously strengthen the productive dialogue and exchanges with the National People's Congress of China, he said.